Although May and June have always been popular choices for weddings, December isn’t far behind. There’s nothing more inspiring than coming in from the cold to a glorious candlelight wedding, then later exiting into a starlit night to wish the couple on their way. I recall witnessing a wedding years ago where a couple glided away in a horse drawn sleigh. As the cheering died down, you could hear sleigh bells jingling far into the distance. 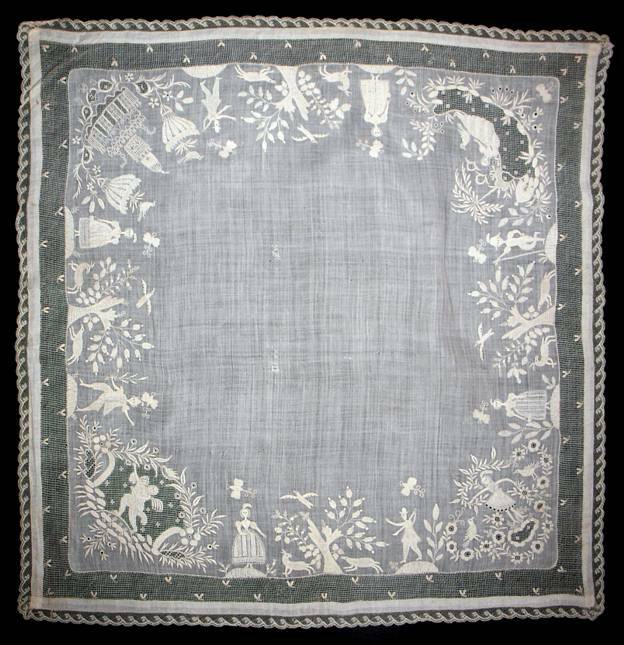 At 22” square, this antique wedding handkerchief is, to me, spectacular. Carried alongside a bride’s bouquet, it would be a striking accompaniment, and augment the overall feeling of romance. 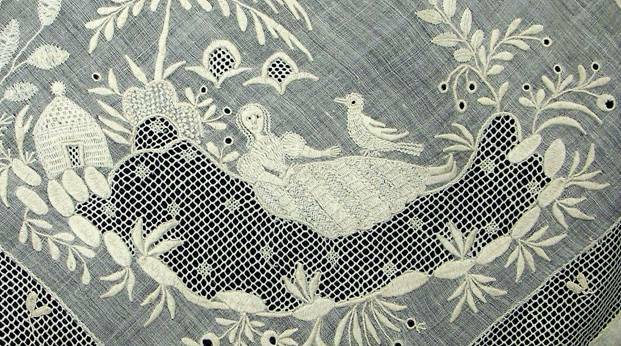 Embroidered couples adorn the border and bring to mind tales of passionate couplings through the ages, some joyful, some tragic, but all inflamed with passion. From Romeo and Juliet to Antony and Cleopatra, Lancelot and Guinevere, Tristan and Isolde, Paris and Helena, Odysseus and Penelope, Eloise and Abelard, right down to Elizabeth Bennett and Fitzwilliam Darcy, Queen Victoria and Prince Albert, and forward to today’s Kate Middleton and Prince William. Note the very large butterflies over the crown of each man and woman. As we learned in Bridal Butterfly, these winged creatures symbolize new beginnings. The images are quite similar, with only slight differences in the foliage, animals, etc. The greatest variation appears in the bride’s dresses and accessories. Naturally, no two women want to wear the same gown! 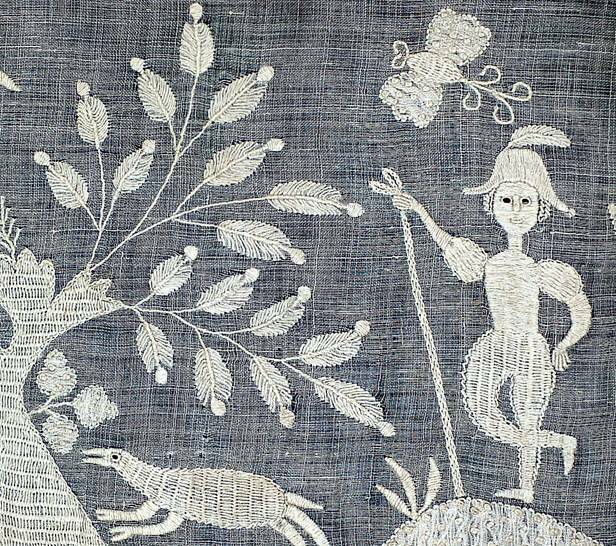 Note the variety of stitches in the foliage, the man’s jacket compared to his trousers, etc. The confident, carefree swain in the feathered cap below resembles the cat that ate the canary. He views this romance as a fait acccompli, and methinks he’s correct! In contrast, this jovial fellow dancing in his little pointed cap doesn’t appear to understand the seriousness of the endeavor he’s about to undertake. Okay fashionistas, let’s take a closer look at those gowns. Although I photographed this against black, some are still easier to see than others. Note the girl in the middle. 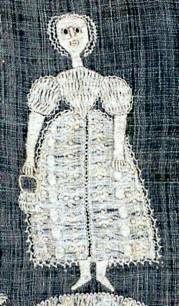 The bodice is one stitch, the sleeves another, the skirt, two additional stitches, the hair another stitch, and her feathered plume another. The fourth dress may appear quite simple, but elegant in its simplicity (think classic Vera Wang). 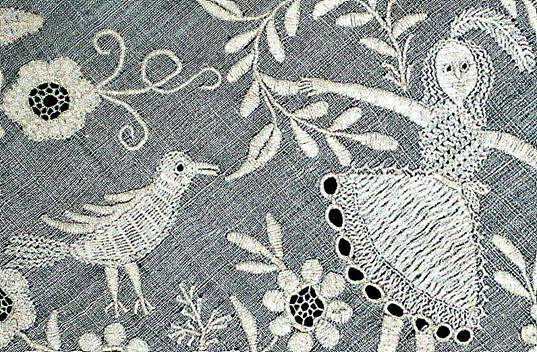 I included the marvelous blossom and bird, as they too, are a showcase for stitches. A close up of our debonair darling in his final days of bachelorhood. Note the detail in the butterfly. 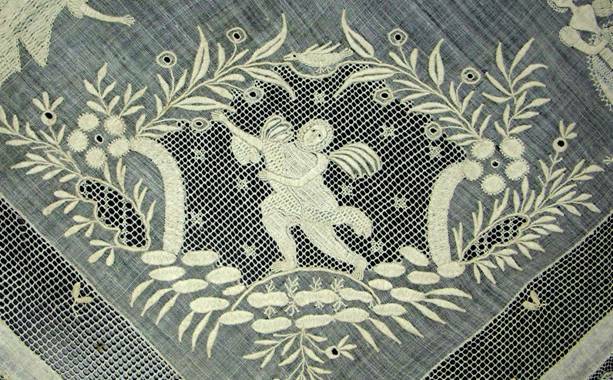 The handkerchief corners provide new chapters in love’s tale, including a glorious cupid. A fair maiden waits in anticipation for cupid’s arrow to strike. even with your weaknesses, your flaws, everything starts to click into place. you’d be crazy not to want to spend the rest of your life with her. A carefree ingénue on the cusp of a first spring romance. 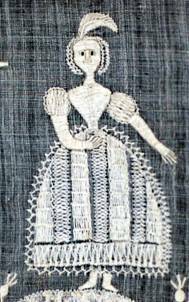 Note how the artist directed the stitches to emulate the wind catching her petticoat. And of course the cathedral where the wedding will take place. With 2.3 million marriages annually in the U.S., that averages out to nearly 6,200 weddings per day. With so many tears of happiness shed, I believe more wedding handkerchiefs are in order – and the lovelier the better. 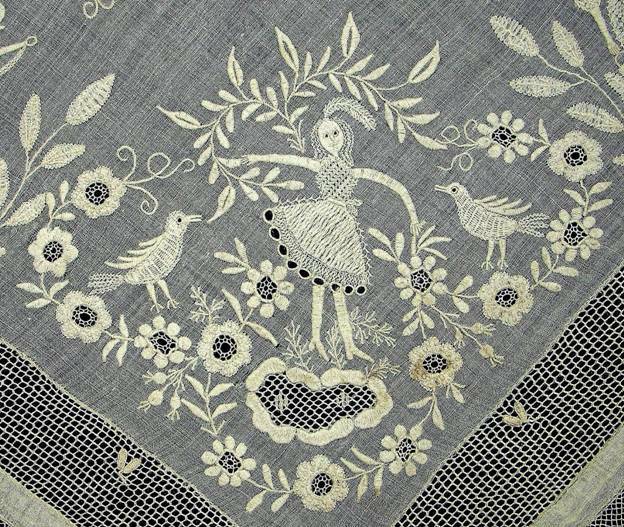 If I understand correctly what I’ve been told, this handkerchief may have been part of the Blackborne Lace Collection. This particular piece was purchase by Darlene Armour from Julius Sternfeld. 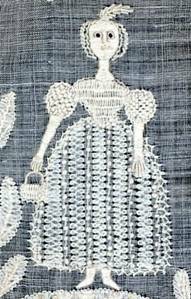 From what I could gather on the web, he was a lace importer located at 114 East Twenty-Third Street. (The New York Supplement, pg 1062) He was also responsible for inventing a perforating machine used in making lace designs. 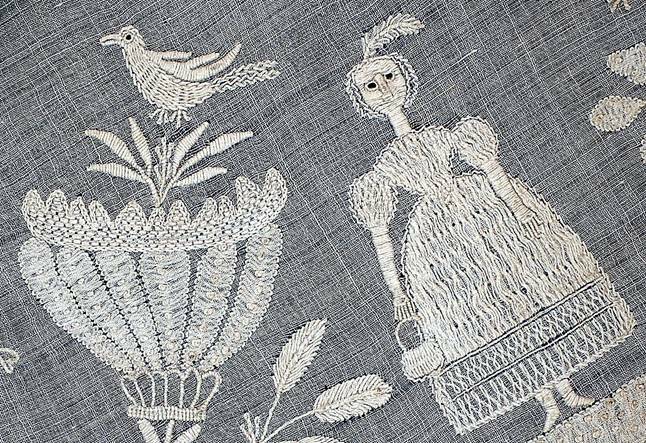 (Textile America) According to Ms. Armour, who met Sternfeld in the 1980s when he was quite elderly, he attended museum auctions to assemble his collection. Over the years, he would sell off a piece here and there. Ms. Armour closed her shop in 1989 and moved to Scotland and lost track of Sternfeld. Web accounts have him passing away in 1991, so I guess I’ll never know the complete history of this piece. 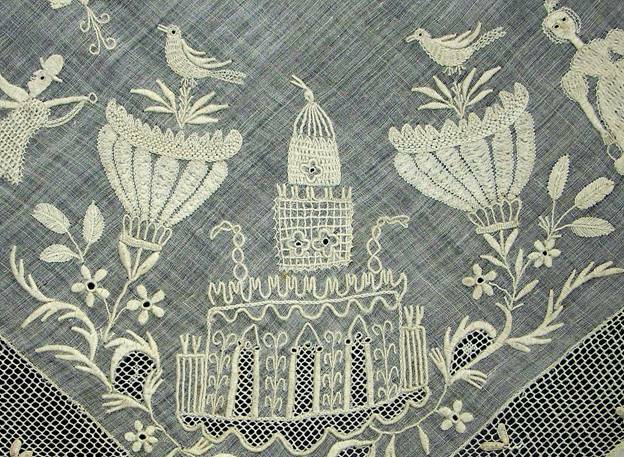 Blackborne Lace Collection, Bowes Museum, County Durham, U.K. 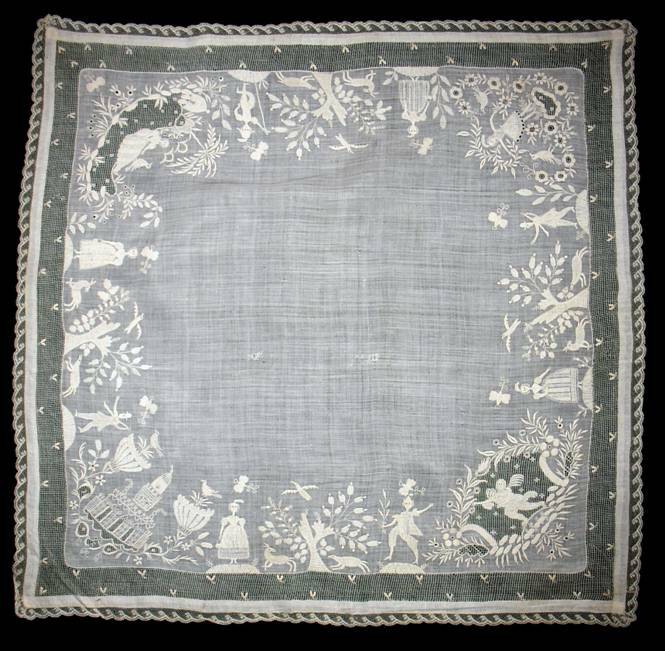 I love this hanky and I love your comments. You made me stop and really look at the design. Always keep up the good work. You love hankies and it shows in your blog. Know that at least one hanky lover (ME!) is out here reading your comments. I’m so glad. I love it when readers enjoy these special works of art. Gorgeous handkerchiefs. Love it. I love creating custom made wedding handkerchiefs also. The photos here are gorgeous. Thanks for sharing. I love everything wedding! Then you’ll enjoy our other wedding blogs (and we’ve just begun). In the search bar, type Bridal Lily, Bridal Butterfly, Bridal Bouquet, and stay tuned for more. Thank you for responding. We love to hear from resources. Thank you for the great information. I just found your site and love it. Keep the stories coming! !